Note: A syndicated show called "Ranch Party" was spun off as part of this show. It is not the intent of this writing to document anything related to that particular show. The Town Hall Party show has raised some interesting debates as to determining who was a part of the show. The truth of the matter, there were two or shall we say three iterations "Town Hall Party" shows. The first one was the radio show. 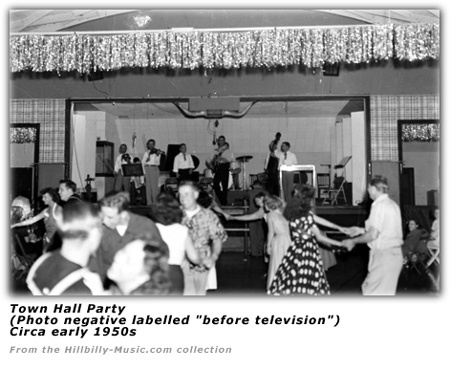 The Town Hall Party went on the air in the fall of 1951. It was started by Foreman Phillips who was quite successful promoting country music shows in the Los Angeles area. The show was put on at the "Town Hall" building located at 400 South Long Beach Boulevard in Compton, California. It first was broadcast over radio station KXLA out of Pasadena, California. It aired from 9:00pm to 9:30pm on Friday nights. On Saturdays, it was also on from 8:30pm to 9:30pm over the NBC network. But our review of radio logs does not seem to show it airing over KXLA. However, doing some further digging, it appears that local newspapers were not listing any of the programs aired over KXLA in the fall of 1951. 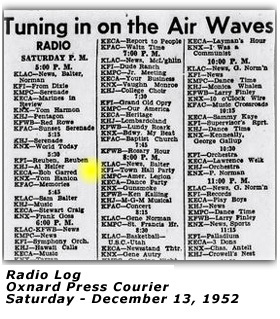 Both The Los Angeles Times and the Long Beach Independent would show KXLA in their list of stations (1110 on the AM dial), but listings did not show any programs on KXLA! We found in our research that the show then moved to radio station KFI and was broadcast at 8:00pm on Saturday nights for a half-hour. But over time, we found it moved as the radio station would change its programming. The Town Hall Party drew in excess of 2,800 paid admissions each Friday and Saturday and they said that the attendance records they set were more interesting considering that they evidently charged more than other shows for admission. The show was more than just the artists on stage entertaining the audience. The theater sat about 1,000 folks in front of the stage, but at the same time about another 1,200 or so would be dancing in the rear of the huge ballroom. Occasionally in our research, the newspapers would list the guests appearing on the KFI broadcasts. 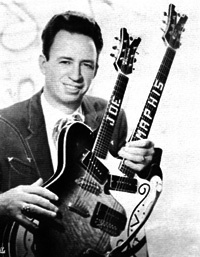 For example, May 3, 1952 - Eddie Kirk and his band provided the musical backing for Dude Martin, Sue Thompson, Eddie Dean, Les (Carrot Top) Anderson, Wesley Tuttle, Karen O'Hara and the Pine Ridge Sisters. 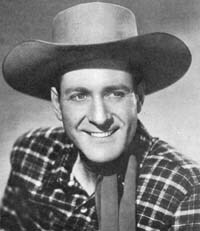 On April 11, 1953 it was to be "Oklahoma Night" and they were featuring Jimmy Wakely. In July of 1953, KFI did make some programming changes. They were going to start airing "The Tex Ritter Show" at 7:30pm - Tex was to play recordings from his personal collection. Which meant that the Grand Ole Opry, Town Hall Party and New Talent USA were to be on 30 minutes later than usual. A couple of weeks later, KFI added "The Tex Williams Show" from Knots Berry Farm, preceding the Tex Ritter show. In 1954, we learn that Eddie Kirk's new band was called "Hollywood Caravan" and included a 15-year old singer by the name of Eddie Downs. Stay with us now. 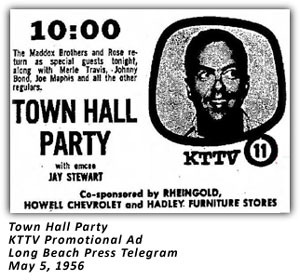 On Monday, December 1, 1952, the "Town Hall Party" television show was first broadcast over KTTV (Channel 11) in Los Angeles. There were to be two segments of a half-hour sandwiched between a broadcast of the "March of Time" show on KTTV. 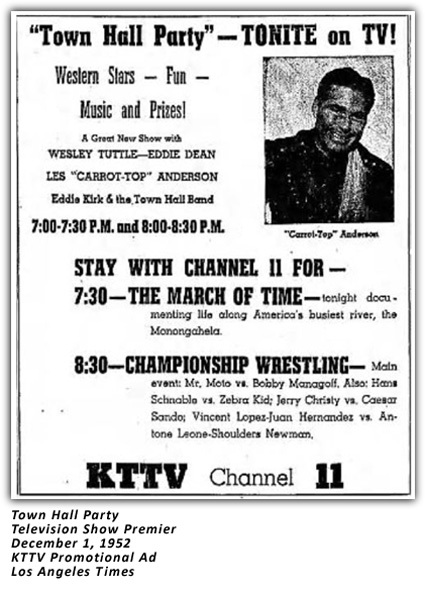 Two articles, one by King Charles in his "Looking and Listening" column in the Long Beach Telegram and the other by Terry Vernon in his "Tele-Vues" column in the Independent of Long Beach wrote similar stories of the show's debut that night. The stars of the show were to be Eddie Dean, Les (Carrot Top) Anderson, Wesley Tuttle, Eddie Kirk and Patty Woods. The first half-hour show was at 7:00-7:30pm. Then the KTTV show "March of Time" show would air. Then the second half-hour would air from 8:00-8:30pm. There was a ploy behind having two segments. The first half-hour portion was the start of a "send-out" stunt and in the second half-hour, they would award prizes. The studio audience would be held over for games and entertainment. The show bumped the "How Did We Meet?" program to Friday nights. However, this first attempt at a television show ran into some hiccups. On March 2, 1953, we read two newspaper reports of the program's financial strains. The show would only be a half-hour that night. If a sponsor was not found, this would be the last show. 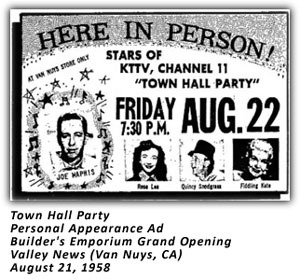 The televised version of Town Hall Party was off the air until a small article on August 29, 1953 told readers that KTTV (Channel 11 in Los Angeles) was going to debut "...the greatest array of western talent ever assembled on any one platform for a TV series..." at 10:30pm. The show would be two hours long and was airing from the same 400 South Long Beach Boulevard address in Compton. The lineup on that first show was to be Tex Ritter, Les (Carrot Top) Anderson, Wesley and Marilyn Tuttle, Jack Lloyd, Joe Maphis, Rose Lee Maphis and Texas Tiny (a disc jockey at KFOX who had a three hour a day show). 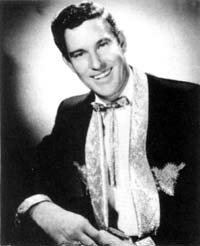 Tex Williams and his band were to provide the musical backing for performers. Jay Stewart was to be the announcer. The article mentioned "...Show is a TV version of the old favorite KFI show." At the same time, the Town Hall Party radio show was also being aired over KFI at 8:30pm. Thus, this is another example of both the radio and television versions on the air concurrently. The Town Hall Party radio show was at times aired twice a week. An example of this would be a weekend in September 1953. On Friday night, September 18, 1953, the show aired for a half-hour over KFI at 9:00pm. On Saturday night, September 19, 1953, the show aired at 8:30pm and ran to 9:30pm where it was followed by Spade Cooley's show. On December 12, 1953, the show was celebrating a 'second anniversary' and was to feature guest stars Sue Thompson and Hank Penny. A week later, another theme for the show was reported. Texas Tiny, local disc jockey, was to take on the role of Santa Claus on the show, though they promised no reindeer would be used to pull him around (he was not tiny). The songs on the show would be seasonal and with some emphasis on novelty types. The show would close would the traditional hymn/tune, "Silent Night". On December 26, 1953, the TV show moved to the 10:00pm slot as Stuart Hamblen's shows were "dropped". On Saturday, January 2, 1954, the radio show was airing at 8:00pm for an hour. Then the big news being reported by Terry Vernon in his "Tele-Vues" column was that the TV version was growing into "quite a shindig". The show was expanding to three hours. The article mentions Johnny Bond and Louise O'Brien were now a part of the show. 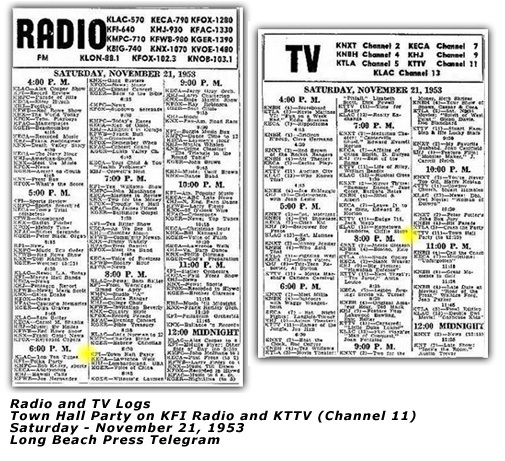 In 1954, research found that guest stars on the show were starting to show up more frequently in the local Long Beach newspapers. Stars such as Bob Wills and the Texas Playboys, Rex Allen, Sons of the Pioneers, Hank Thompson and his Brazos Valley Boys, Grandpa Jones were among the mentions seen. An interesting aspect of this show was it's tendency to showcase young talent and not necessarily country oriented. In 1954, an eight-year old girl named Patti Kent was making appearances on not only the Town Hall Party, but also Squeakin' Deacon Moore's show on KXLA, as well as appearances with the Charlie Aldrich and Doye O'Dell shows. The article goes on to state that her first recording (Mexicali Rose) was done when she was just 22 months of age! She made her stage debut at the age of three! Another unique act was Nancy Wible and her "Candy" - a mannequin/puppet of sorts. Another female vocalist came from the pop field - Patti Woods. She was from West Virginia. She made a name for herself imitating Clyde McCoy playing the trumpet on the tune "Sugar Blues", using her hand and mouth to do so at the age of 18. 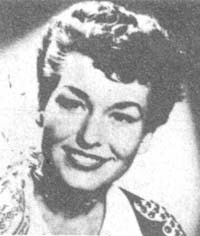 She heard of an opening for a female vocalist on the Town Hall Party and by contacting the producer, Bill Wagnon, she got herself an audition with Eddie Kirk. She got hired and appeared on both the radio and televised editions of the show. 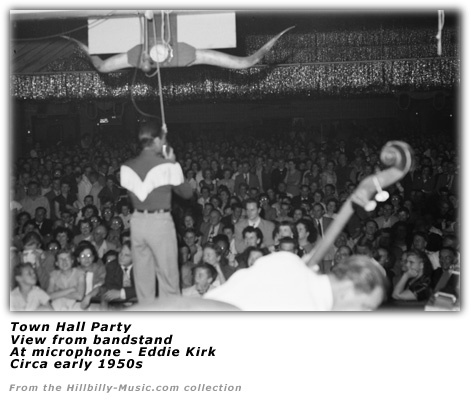 In 1954, it appears that Eddie Kirk was the face / leader of Town Hall Party. 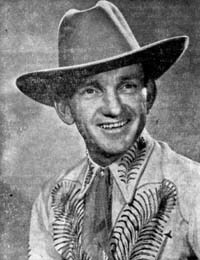 Eddie Dean was the subject of an "On The Spot" interview in Country Song Roundup. He was asked what his current activities included. His response in that column was "...featured vocalist with Eddie Kirk's Town Hall Party... in Compton, California." When history steps back to look at those who were part of this show's cast, it sees many legendary performers. We can start with Johnny Bond, who was the write for the show. Wesley Tuttle was the show's musical director. Producing the show was Bill Wagnon. "Each show has a theme and we give the theme of the following week's show to our cast on Friday. They tell us the numbers they would like to do. On Monday, Johnny and I get together and routine the musical portion of the show. Then, Johnny takes the material to his office and writes the script." "I try to keep down the talk and make the songs and artists the main feature. Aside from the dialogue introducing the artists and their songs, we have two talk spots on the show. These are comedy spots handled by Merle Travis, Texas Tiny and myself, with Merle, Tex Williams, Tex Ritter and myself alternating as straight man for Tiny." Johnny would finish the scripts for the show on Wednesday, then there would be a meeting between Johnny, Wes and Bill Wagnon to talk over the radio and TV scripts before they got turned into the network and station script departments. Thursdays were their day off - before the hectic pace of Friday and Saturday kicked in. When Fridays came around, rehearsals were at 7:00pm and went for about an hour while Johnny was timing the script and Wes timing the music. On Saturdays, their routine was to run through rehearsal around 5:00pm. As Wesley mentioned before, each show had a theme. Some of the themes included subjects like "Hank Williams Night", "State Nights", "Veteran's Nights", "Jimmie Rodgers Night" and on it went. The emcee of the show was Jay Stewart. Heading up the ten-piece Town Hall band was Tex Williams. 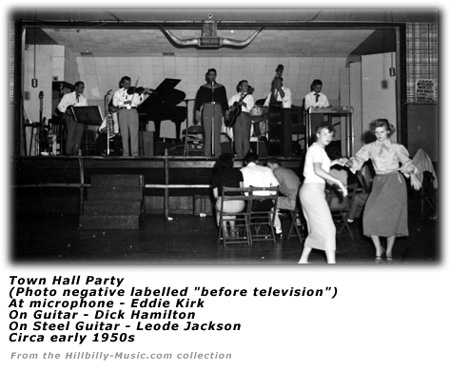 The band included such folks as Billy Hill and Fiddlin' Kate. In January 1955, it was reported that a new country music show was starting up in Columbia, Missouri - the Ozark Jubilee and would be hosted by Red Foley on the ABC television network. 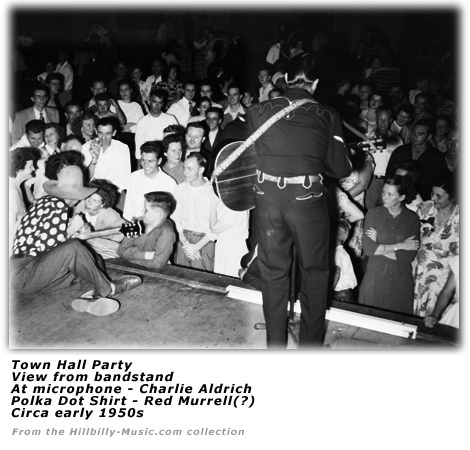 Perhaps the popularity of Town Hall Party and other similar country music-themed shows were the inspiration for Mr. Foley's show. His initial cast was to consist of Jean Shepard, Hawkshaw Hawkins, Arlie Duff, Tommy Sosebee, the Oklahoma Wranglers, Grady Martin, the Foggy River Boys, Porter Wagoner and Pete Stamper doing the comedy. That same night, Bob Wills and the Texas Playboys were appearing on KFI and the Town Hall Party. But January 1955 also saw the Town Hall Party radio show making waves. It's Saturday night 7:30 to 8:30pm show was going to begin to have the first half-hour of the show broadcast over the NBC network. The second half-hour was going to air over only the NBC stations on the west coast. The Billboard blurb provides some details as to the cast members at that time which included: Tex Ritter, Merle Travis, Wesley Tuttle, Johnny BOnd, Joe and Rose Lee Maphis, the Rangers Quartet, Mary Lou (Johnson), Betsy Gay, Freddie Hart and others. At that time, the show was being directed by Wesley Tuttle, written by Johnny Bond and managed by William Wagnon. 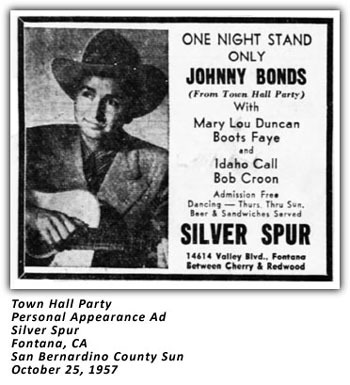 In May 1955, a large newspaper ad plugged the Town Hall Party and mentioning Dude Martin. 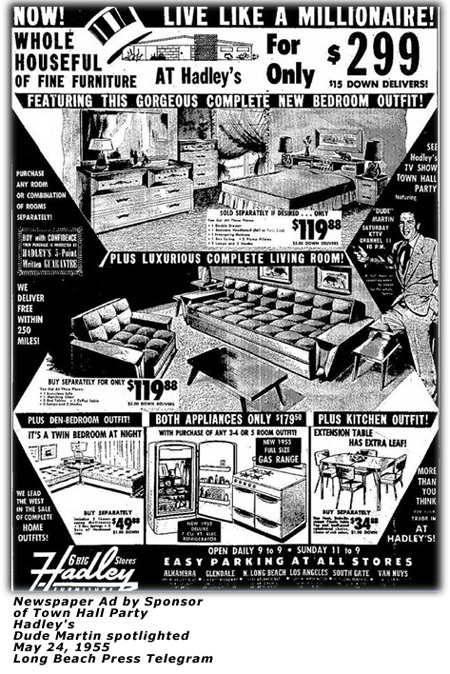 The ad was for Hadley's Furniture and they had stores in Alhambra, Glendale, North Long Beach, Los Angeles, South Gate and Van Nuys. In some of the video clips of the show seen on youtube, the Hadley's logo can be seen on the backdrop behind the drummer. Other sponsors we have seen mentioned in newspaper ads are Rheingold and Howell Chevrolet. In June of 1955, the radio show aired on KFI was to wind up its season. The reason is that the show was going to moved to Sierra Creek (or View?) Park and do three shows a day on Sunday for park visitors. Mention was made that KFI may air those shows. However, they must have changed their minds as we continued to see the radio listings on KFI on Saturdays at 8:00pm in following weeks. However, in the last few months of 1955, the KFI show was not turning up in searches and was not seen on the Saturday night radio logs. The time slot was seeing folks such as Tex Ritter or Merle Travis listed. The last listing we recall was August 20, 1955. Dude Martin had a successful in the San Francisco area with the Hoffman Hayride where the show would do on-location broadcasts for Hoffman Television, the show's sponsor. In Los Angeles, the show would do similar. One such occasion was to herald the opening of a new Hadley's location in late November 1955. The public was invited to 'watch them broadcast' and indicated that several of the cast would be there including Dude Martin, Johnny Bond, Fiddlin' Kate, Mary Jane Johnson and Texas Tiny. The new store's location would be at 1334 Los Alamitos Avenue in Long Beach. The furniture worked with local papers to get some publicity for the event including having Texas Tiny 'testing' a new sofa. The show would be 'live' at the location from 10 to 11pm. 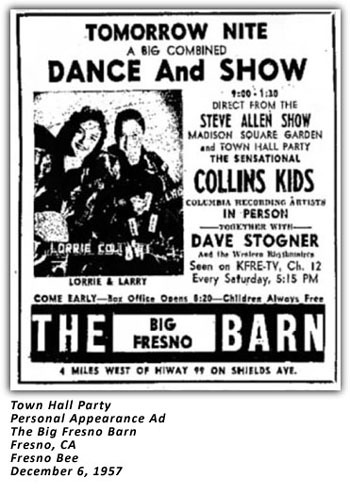 In July 1956, the Corona Daily Independent reported that Larry Collins, 11-year old brother of Lorrie Collins was going to host his own show "Western Spectacular" on KTTV. Things began to happen for the show in 1956 as its popularity grew. Walter Ames reported in the August 8, 1956 Los Angeles Times the show was about to be filmed for national distribution. 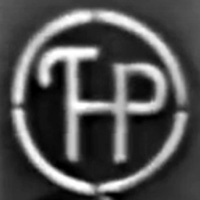 He wrote that Bill Wagnon, Jr. and Mitch Hamilburg had formed "Town Hall TV Productions". They were going "...to do the show as a half-hour presentation with each segment presenting eight top recording stars." We found some further insight into the show in another column by Mr. Ames on November 10, 1956. KTTV was going to interrupt the Town Hall Party that night after the first hour (from 10:00-11:00pm) to broadcast a special Christmas show benefiting the local Community Chest and hosted by Art Linkletter. The second half would air from midnight to 1:00am. Mr. Ames went on to quote Bill Wagnon, Jr., producer of the Town Hall Party. "...Western or country music is the stepchild of Madison Ave. advertising executives. They don't like it but they're coming to realize that it sells their products for them. They've been overlooking the fact that country music record sales are at an all-time high these days." Mr. Ames noted that there was always a steady stream of artists on the show. That particular night, the show was going to feature Grand Ole Opry stars Carl Smith, Cowboy Copas, Arlie Duff, The Farmer Boys, Tommy Collins and Ken Marvin. He also noted that two of Mr. Wagnon's proteges, Larry and Lorrie Collins had returned from their eastern tour where they "...wowed the natives." In November 1957, the Star-News was reporting a "bigger and better" Town Hall Party. Tex Williams, Spade Cooley and Doye O'Dell would rotate as emcees during the Saturday night three hour broadcast. Billboard reported that this new three hour format started on November 23, 1957. Other details included the fact that Jay Stewart and Charlie Williams (dj on KXLA) would handle the intermissions. It further mentions some of the cast once again including: Mac Wiseman, Bonnie Guitar, Merle Travis, Tex Ritter, The Collins Kids, Johnny Bond, Bobby Charles, Joe and Rose Lee Maphis, Johnny O'Neil, Les (Carrot Top) Anderson, Gee Nee Sterling, Johnny Western, Dortha Wright, Bonnie Sloan, Quincy Snodgrass and Wendy Hill. Fiddlin' Kate and Pee Wee Adams (drums) were the only old band remaining. New members included Jelly Sanders on fiddle, Billy Mize on steel, Cliff Crawford (Crofford) on trumpet, Cousin Herb Henson on piano and Skeets McDonald playing bass. Billboard magazine reported in August 1960 that Lefty Frizzell and Freddie Hart were going to rejoin the cast of Town Hall Party on September 3. They had been off the show for the previous two years. The show celebrated its 8th anniversary on the August 27, 1960 show. That telecast was said to have included Tex Williams, Jimmy Wakely, Tex Ritter, Joe Maphis, Merle Travis as well as Lefty and Freddie. In October 1960, Billboard was heralding the guest appearance on the show. The blurb did provide us with some information as to who some of the cast members were at that time. 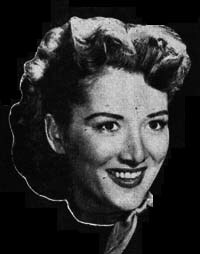 The show's roster included: Lefty Frizzell, Freddie Hart, Johnny Bond, Joe and Rose Lee Maphis, Johnny O'Neill, Skeets McDonald, Fiddlin' Kate, Billy Mize, Cliff Crofford, Big Jim Denoon, Barbara Mandrell, Bonnie SLoan, Geenee Sterling, Quincy Snodgrass, Salty Holmes and Jay Stewart. For the October 29, 1960 show, Billboard reported it would be a Halloween themed show with "spooks and goblins" and Tex Ritter as special guest. Including those named in the previous paragraph, other performers to be a part of that broadcast included Pee Wee Adams, Jimmy Pruett, and, Pat O'Neill. 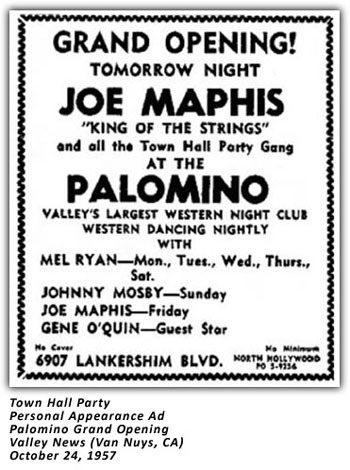 The November 5, 1960 show had another theme; the cast was going to have an Aloha Party for Joe and Rose Lee Maphis and Fiddlin' Kate who were going to the Armed Forces installations in Hawaii on November 9. The cast included those mentioned previously. 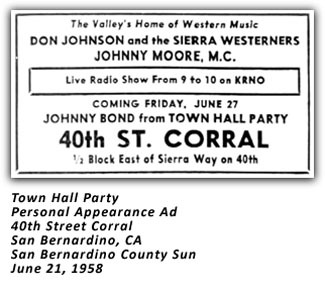 Terry Vernon in his "Looking and Listening" column in The Long Beach Telegram wrote on August 27, 1960 that the show was going to celebrate it's seventh birthday. The milestone would mark 1,092 hours of telecasts. If we extrapolate that to the end of 1960, that is over 1,100 hours of television time. How does that compare to some other long-running popular television shows. A quick search on the internet shows 271 Perry Mason episodes; 431 Bonanza episodes; 360 Alfred Hitchcock shows; Gunsmoke - 635 episodes. To make it a somewhat fair comparison, divide the 1,100 hours by three hours and we get 367 three-hour episodes. And we could not resist the urge to compare it to the long running Hee! Haw! series. One site said ran for 25 seasons and was filmed twice a year where they would do 13 shows each time. If we do the math, 25 times 26 equals 650 shows. But only 650 hours. But if we calculate that the new television show that began as a two hour show then became a three hour show started in the fall of 1953 and ran consecutively until the end of 1960 - that is about 378 shows. We noted previously that attendance could be 2,800. Let's say they averaged 2,500 per show - that's over 945,000 people that saw the show in person in Compton. If every show was attended by 2,800 - then the math shows 1,058,400 people attending the show. In a Febrary 1957 Billboard article touting that Screen Gems would go ahead with producing a new show called "Western Ranch Party". That article stated the Town Hall Party attendance on Saturday nights was 3,000 and the price of admission was $1.50. The show was to end at the end of 1960. The Long Beach Independent-Press-Telegram in their TV guide included with the Sunday December 25, 1960 newspaper indicated the last show on December 31, 1960 was to be a three-hour New Year's Eve celebration. However, that show may not have aired. 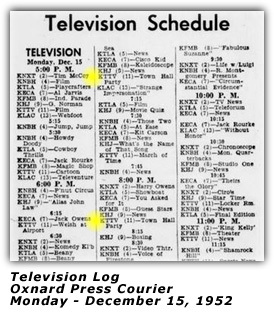 The Oxnard Press-Courier TV listing for Saturday, December 31, 1960 shows that KTTV (channel 11) was airing a newscast at 10:00pm, followed by Paul Coates at 10:15, then weather and sports news until 11:00pm. Highway Patrol was airing at 11:00pm. The second iteration of the Town Hall Party television show over channel 11, KTTV, should be noted for its longevity. It was different than most television shows of the era which did not run every week of the year. Town Hall Party was a live broadcast every week during its run as far as we can tell. It was interesting in reviewing television listings to see what other channels were pitting against the show at its 10:00pm slot. The year of 1954 saw shows such as You're Never Too Old, a Harry Owens show, George Goebel and a show starring Henry Fonda called "A Star and a Story". In 1955, other stations were pitting George Goebel's show along with movies or even a show by the Ames Brothers. In 1956, we saw shows such as Gunsmoke, George Goebel, Encore Theater, The Late Curtain and The Falcon pitted against the show. 1957 saw the competition get a bit stiffer as the Ozark Jubilee starring Red Foley and George Goebel were now being scheduled at the same time. We also saw Mike Wallace Interview show on the listings. Television listings in 1958 saw the Sammy Kaye show, Ted Mack's Amateur Hour, Mike Wallace Interview show and movies pitted at the same time slot. In 1959, Red Foley's Jubilee USA was in the same time slot. You wonder if the network thoughts were to divide the audiences at the expense of possibly losing both shows. 1959 also saw the Sammy Kaye show in the same slot as well as several nights of the Billy Graham Crusade from Australia. Jubilee USA continued to be pitted in the same slot in 1960 along with some new shows such as Music For A Summer Night or Let's Dance with Al Jarvis. During the research effort for this show, we would find out other items of interest. For example, one cast member was Gee Nee Sterling (yes, she admitted to spelling her name that way as a form of standing out a bit). She went through a divorce and in 1964, married Bobby Bare and they moved to Nashville. One female duo we noted was the Southern Belles. This was a sister team of Nelda (Ned) Fairchild and her sister Teena (Ella) Fairchild. Nelda was a songwriter and had a few tunes recorded. She divorced her first husband Jack Farnsworth. In 1950, she married Richard Bingo. She began to perform under the name "Sunny Bingo". She passed away in 2015. Another female duo was the Harmony Sweethearts. In 1954, they were Norma Palm and Linda Robinson from the state of Washington. Linda later quit the music business. Norma kept at it for a time and under the name of Norma Lee. You will find her biography elsewhere on this site. The research saw the comings and goings and life events as well. 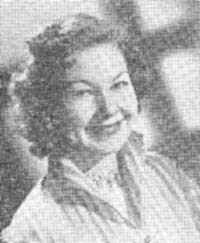 Betsy Gay, a yodeler, got married to Tom Cashen while on the show and also gave birth to twins. We had a chance to interview her a few years ago and you will find her biography elsewhere on the site as well. Joe and Rose Lee Maphis experienced the birth of a child as well during the run of the show. In other instances, we would see the performers announced as performing at the local churches as well. Attempts were made to determine William Wagnon, Jr.'s date of birth and death. It appears he was born on March 27, 1913. The information we found indicates he died in May of 1986 but have not been successful in finding an obituary. He married Veva Bell Davis who was born in Oklahoma in 1921 and died in May of 1982. We did not find any obituary for him. One of the show's long-time hosts television version was Jay Stewart. His real name was Jay Fix, the son of Julian Cleve Fix and Ressie Mae (Jenkins) Fix, and was originally from Indiana and did work on radio stations WBOW in Terre Haute, Indiana and also the powerhouse WLW in Cincinnati, Ohio. He moved to Los Angeles in 1943 where he continued to work in radio. He had over a 50 year career in broadcasting. Obituaries from September 1989 do no mention his work on the "Town Hall Party" show. His fame stemmed from being the announcer for the "Let's Make a Deal" show that was hosted by Monte Hall. From 1963 to 1976, he was the show's announcer. He was known for "Jay's Tray" in which he carried a covered tray that carried a concealed prize. Sometimes the prize was valuable, sometimes it was not. But Monte would haggle with one of the audience members over the value. The audience was known for dressing in costumes. And indeed Jay himself got into the spirit and would sometimes appear dressed as a baby when someone picked what was behind the 'wrong' door. His obituaries mentioned his work on "The Joker's Wild", "Sale of the Century", "Tic Tac Dough". He also worked on "The Kate Smith Hour", "Carnation Family Party" and "It's Fun To Be Young". When Mike Douglas moved his show from Philadelphia, Pennsylvania to Los Angeles, Jay became the announcer for the "Mike Douglas Show". He later retired from announcing and became an agent himself for emcees and announcers, especially for game shows. In 1981, his oldest daughter committed suicide. Her death caused him to take a leave from his work and turned to religion. He appeared on Pat Robertson's show, "700 Club" to profess his faith and did voice over promotions for the CBN cable network. But never overcame the depression and years of chronic back pain. He died of a self-inflicted gun shot at his home at the age of 71. He was survived by his wife and another daughter. Below represents an attempt to document when each Town Hall Party show aired, TV and/or Radio during its run. The listing is based upon review of various newspapers and TV/Radio listings during the time span. Performers listed may not always have appeared but are based on what was published. KTTV 11/13/1954 10:00 PM 1:00 AM 3 Central Chevrolet; Hadley Furniture Co.
KTTV 6/4/1955 10:00 PM 1:00 AM 3 Hadley Furniture Co; Mike McCarthy; Advance Aluminum Co.